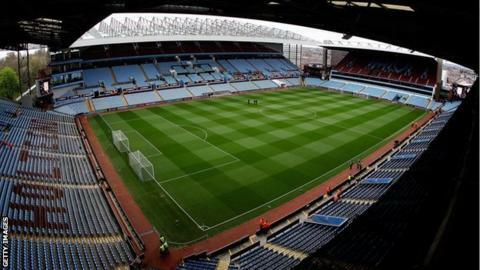 Aston Villa chief executive Tom Fox says the Premier League club is targeting a regular challenge for European football within three years. And he is insistent that manager Paul Lambert is part of that plans. "We should be finishing seventh or eighth consistently," Fox told BBC WM. "We should be competing consistently up there for a place in Europe, and putting us within touching distance of the larger clubs. And I don't think that takes four years," he added. "What I've communicated to our owner Randy Lerner is that this club can be seventh or eighth in terms of revenue. "I think it will take three years to put ourselves in a better position than we are now. We don't have to wait that long to determine whether we've been successful against where we want to be." Villa, European Cup winners in 1982, have operated chiefly in the lower reaches of English football's top division since Martin O'Neill quit on the eve of the 2010-11 season. And, following the successive failures of Gerard Houllier and Alex McLeish to get them kick-started at a time when it appeared that American owner Lerner's interest in the club was on the wane, Villa have so far laboured under 45-year-old Lambert. Aston Villa won the European Cup in 1982, beating Bayern Munich 1-0 in the final, thanks to a single goal from Peter Withe. Villa boss Paul Lambert won the European Cup as a player in 1997 with Borussia Dortmund, who beat Juventus 3-1. But Fox has made it clear that the awarding of a new four-year deal to Lambert in September following their decent start to the season was all part of a long-term strategy. "Those conversations were happening between Paul and Randy even before I got here," said Lerner's fellow American Fox, who joined Villa from Arsenal this summer. "They have a great relationship. "I am from a business background. And, in business, you don't change one of the most important positions at the club easily. We believe continuity is absolutely critical. "I know one of the things Randy really appreciates is Paul's honesty and his ability to admit mistakes when he makes them. I've seen since that since I came in." Fox continued: "We have a great relationship, the four of us - Randy, Paul, myself and Paddy Riley, who we brought back from Liverpool to join us as director of recruiting. We're talking on a very regular basis about the direction to put the club on the right path. "It's on two fronts. It's what we can do with the football set-up, to strengthen, right from the academy up to the first team, and on the commercial front. "How do we put the club in position to capture it's value? If we can do that, we believe we can put this club back where it deserves to be."